A mini version of the Envirocloth. This cloth sanitizes surfaces and is great for cleaning up spills when out. High quality microfibre that grips to skin when dry. This multi-purpose, antibac microfibre removes dust, dirt, grease and bacteria from washable surfaces. Wet with water and wring out well, and the cloth will wipe away dirt, water, grease and unsanitary residues and up to 99.9% of germs and bacteria. WHERE TO USE: Like an ordinary envirocloth you can use it damp on walls, windows to remove dirt before using a dry glass cloth, floors, toys, kitchen and bathroom areas, appliances, sinks, shower and toilet. Use dry when dusting. It is also a great stain remover on carpets and upholstery (spray stain with water place a dry cloth on top of the stain and agitate with your foot to remove the stain). This mini-size is ideal for camping or travelling. Can also be used to wipe shopping trolley handles, tables when out, spot cleaning clothes, wiping faces and hands, cleaning up spills in the car, sanitising dummies or children’s toys that have fallen on ground etc. HOW TO USE: Wet the cloth and wring out. Start cleaning, flip over and continue to do this until all surfaces are used. Rinse the cloth in water when necessary and continue cleaning. When you first clean heavily soiled areas with your cloth, you will notice a resistance when wiping with a dampened cloth. Keep rubbing surface until no resistance. When the cloth glides smoothly over the surface, the surface is clean. For travel – carry wet if using it regularly and then launder when necessary. For more infrequent users, keep dry and then wet when necessary. 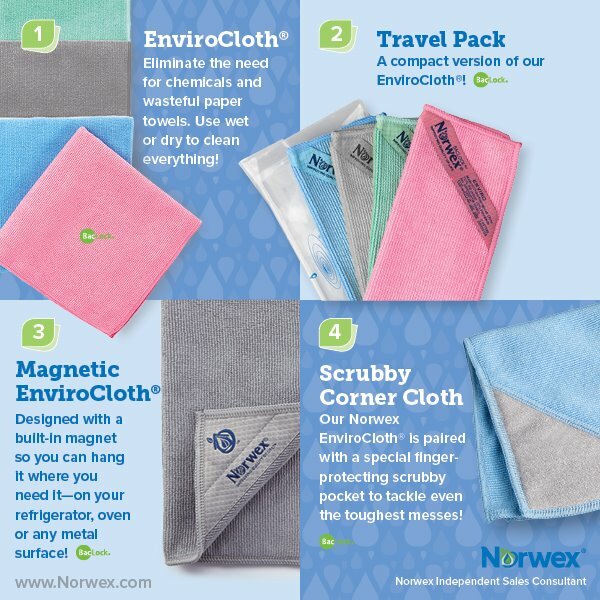 Host in Australia and New Zealand typically receive a pack of the travel envirocloths in their host rewards, if they have 15 or more guests purchase through their party. You can buy the Travel Pack online from me, in Australia. Or you can buy it in New Zealand here. If you are elsewhere, check Norwex.com to find a consultant in your country.